CHICAGO (WLS) -- ABC 7 put you in the driver's seat with a spectacular preview of the 2018 CHICAGO AUTO SHOW on Saturday. ABC 7 PRESENTS THE 2018 CHICAGO AUTO SHOW, hosted by Mark Giangreco and Jim Rose, was a live, hour-long special showcasing all of the bells and whistles that come with some of the finest cars, trucks, and SUVs the industry has to offer. ABC 7's Cheryl Scott, Roz Varon, Val Warner, Ryan Chiaverini, Ji Suk Yi and Ravi Baichwal also contributed. An encore broadcast of the live special will air on the same day at Midnight and again on Sunday, February 18 from 4-5 PM on ABC 7. Auto Show Chairman John Hennessy takes Mark Giangreco, Tracy Butler and ABC 7 for a whirl around the showroom. During the special, Auto Show Chairman John Hennessy takes Mark Giangreco, Tracy Butler and ABC 7 for a whirl around the showroom to spotlight the stand-out offerings of the 2018 show and reveal some surprise attractions. Automakers give the inside scoop on the most exciting vehicles making their debut this year. Automakers give the inside scoop on the most exciting vehicles making their debut this year. Traffic anchor Roz Varon shows viewers the best way to get to the nation's largest auto show and even how to save money. The newest vehicles from Nissan, Volkswagen and Kia are on display at the auto show. What are the latest tech advancements in the automotive world? ABC 7's Windy City LIVE, Ji Suk Yi hops behind the wheel to showcase the newest technology that takes consumers one step closer to autonomous cars. For example, the Cadillac CT6's long-awaited Super Cruise allows for a true hands-off driving experience, and in case of an emergency, even offers life saving features. The latest tech advancements in the automotive world and the coolest concept cars. Weekend Anchor Ravi Baichwal walks down memory Lane with ABC 7 personalities and veteran diehard auto show fans who relive some of their favorite auto show memories from past years. A look at the latest from Jeep and Ford, plus past auto shows. Butler also takes you inside the so-called 'Greenest Volvo dealership in the World' to see what great lengths Field's Volvo went through to make a splash on the green scene. The newest models from Kia, Hyundai, Infiniti and Friday night's First Look for Charity event. The 2018 Chicago Auto Show special returns for the 4th year to ABC 7 through a partnership with the Chicago Automobile Trade Association and ABC 7 Chicago - pairing the most watched television station in Chicago with the largest auto show in North America. This year will mark the 110th edition of the show. New offerings from Fiat and Cherolet at this year's auto show. Chicago new-car dealers have been outstanding community partners, lending support to local schools, Little League teams and local charities for years. The 2018 Auto Show profiles dealerships like Wickstrom Auto Group and the Bredemann Family of Dealerships and their amazing commitment to three area charities. The special also highlights the dozens of other dealers who fire up their grills and raise thousands for U.S. troops each summer with their USO Barbecue for the Troops. This year's auto show has over 1,000 vehicles on display from 40 automakers. 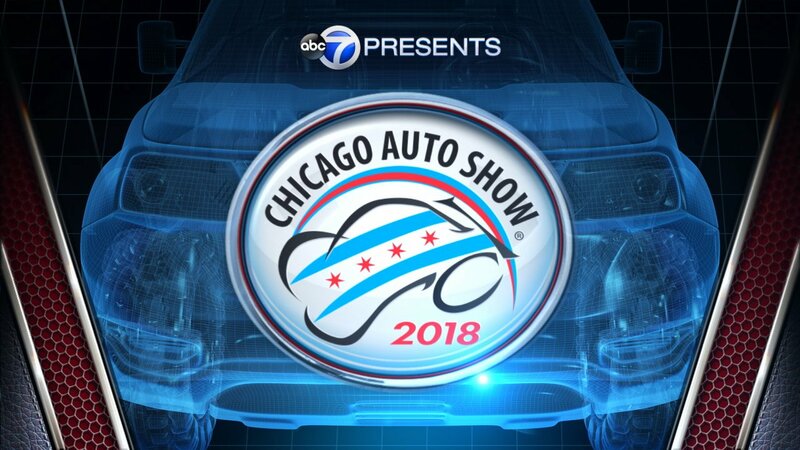 The Auto Show special will be broadcast live on ABC 7's 7.1 and 7.2, available on the ABC 7 News App and will also be available live and on-demand on ABC7Chicago.com.